Martian Icecaps - Solar System Planets And Moons Section. Mystery of Martian Icecaps Explained. Hubble view of Mars, including its polar ice caps. Image credit: NASA. Mars' southern polar ice cap is completely off-centre. Researchers working with NASA think they have an answer to this lopsided mystery: the weather. Mars' southern hemisphere seems to be much colder and stormier than its northern hemisphere, and the southern icecap is only 1/10 the size of its northern counterpart. 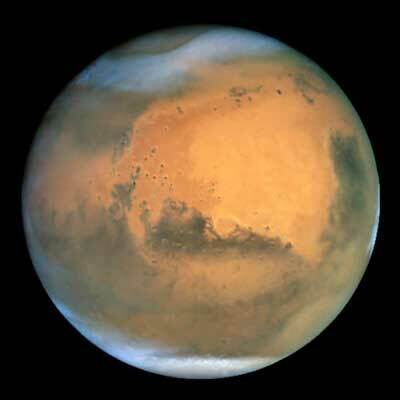 The researchers have discovered that Mars has two regional climates on either side of the pole, which are caused by two large craters that create a low-pressure system that sits over the southern ice cap and keeps it in one location. Weather generated by the two martian regional climates creates conditions that cause the red planet's southern polar ice to freeze out into a cap whose center lies about 93 miles (150 kilometers) from the actual south pole, according to a scientific paper included in the May 12 issue of the journal, Nature. "Mars' permanent south polar cap is offset from its geographic south pole, which was a mystery going back to the first telescopic observations of Mars," said the paper's lead author, Anthony Colaprete, a space scientist from NASA Ames Research Center, located in California's Silicon Valley. "We found that the offset is a result of two martian regional climates, which are on either side of the south pole," he said. "The two craters' unique landscapes create winds that establish a low pressure region over the permanent ice cap in the western hemisphere," Colaprete explained. Just as on Earth, low-pressure weather systems are associated with cold, stormy weather and snow. "On Mars, the craters anchor the low pressure system that dominates the southern polar ice cap, and keep it in one location," Colaprete said. According to the scientists, the low-pressure system results in white fluffy snow, which appears as a very bright region over the ice cap. In contrast, the scientists also report that 'black ice' forms in the eastern hemisphere, where martian skies are relatively clear and warm. "The eastern hemisphere of the south pole region gets very little snow, and clear ice forms over the martian soil there," Colaprete said. Black ice forms when the planet's surface is cooling, but the atmosphere is relatively warm, according to scientists. "A similar process occurs on Earth when black ice forms over highways," Colaprete explained. Colaprete's co-authors include Jeffrey Barnes, Oregon State University, Corvallis; Robert Haberle, also of NASA Ames; Jeffery Hollingsworth, San Jose State University Foundation, NASA Ames; and Hugh Kieffer and Timothy Titus, both from the U.S. Geological Survey, Flagstaff, Ariz.